1920…John and Charlie (along with Jessie, Harold and Dorothy…of course) arrived in Oregon in 1920. Whether they stopped in Klamath Falls and considered it’s benefits and disadvantages before traveling to Lebanon, Oregon is unknown. Most likely Peterson & Carlborg began making tools full-time in Lebanon. A press release in the Milwaukie Review, dated May 13, 1948, announced an open house for the public at the P&C factory and stated P&C was beginning its 29th year of operation (meaning an original start date of 1920). 1922…Peterson & Carlborg were still in Lebanon, Oregon in 1922, but the year was a year of transition. John and Jessie’s last child, James Merrill was born in Lebanon in May. In late 1922, they searched for and found a more suitable location for their business in Milwaukie, Oregon. Charlie used his 160 acre farm in Woodland, Idaho for collateral on a loan from 1st National Bank of Lebanon, a transaction recorded in the Idaho County Courthouse in October of 1922. Presumably, the loan was used for improvements or property in Milwaukie for the site of the future P&C factory. 1922 may have also marked the first printed catalog for P&C. Early catalogs showed the company as “PETERSON & CARLBORG, INC.”, with the byline “Genuine Hand Forged Tools” directly underneath. The familiar P&C surrounded by a hexagon was only used at the tops of the pages and the hexagon was awkward, and slightly off-centered. The illustrations showed the tools marked with “Peterson & Carlborg”, although it’s unknown if this was for illustrative purposes or the tools were actually marked in such a manner. “Carlborg C F” is first seen in the Portland City Directory in 1923, with the added notation, “P & C Hand-Forged Tool Co” and was listed for most of the following years. Charlie continued to reside in Portland until his death. P&C was listed in the 1923 edition of Polk’s Portland City Directory. On June 23, 1923 a deed was recorded in the Idaho County Courthouse giving “P&C Tool Co.” ownership of Charlie’s Idaho farm. Multiple reasons may exist for this exchange, but it provided the business with additional capital. 1925…Sometime during 1925, Charlie and John unexpectedly bumped into their old acquaintance E.A. “Ned” Boyd on Broadway Street in Portland. Ned quickly became a business partner building an auxiliary business called “E.A. Boyd Inc.”. E.A. Boyd Inc., was a distribution business for P&C manufactured tools and possibly tools from other manufacturers as well. E.A. Boyd was listed in the Portland City Directory, beginning in 1926 and ending in 1929. All four years, Ned’s address was 2012 E. Stark. 1927…In 1927, Ned hired John Derville, possibly as an assistant manager for E.A. Boyd Inc.. Ned and John had met previously in Boise, Idaho in 1919-1920 at a Masonic Lodge meeting. Whether John and Charlie also met Mr. Derville on one of their Boise trips is unknown, but possible considering the time frame. 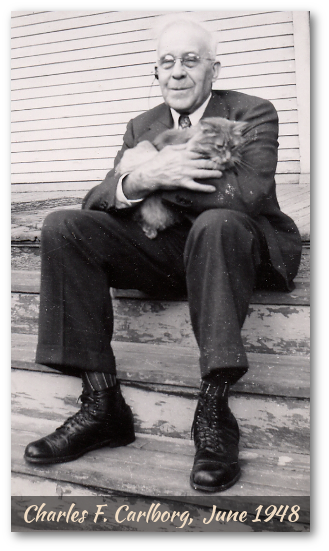 After Boise, John Derville worked in Olympia, Washington as a teletype operator. With the advent of the telephone, and subsequent demise of telegraph, he lost his job and re-located to Portland where he was hired by Ned. Much of the information extant about these years developed from an interview by serious tool collector and historian Troy Dietz. Dietz visited General Tool Co. on August 19, 2008. As a discussion at the counter turned to early Thorsen tools, Dietz was invited to a more private room where he found himself in a fascinating discussion about early P&C, Thorsen, and General Tool development with John Derville Jr, his wife and his son Bill Derville. John was about 90 years old at the time of the interview, and Troy described him as sharp and engaging. At the time of the interview, Bill Derville was the president of General Tool Co., the formation of which will be discussed in the following paragraphs. 1928…P&C enjoyed a rapid increase in product line and prosperity. “Peterson & Carlborg Inc.” had changed sometime in the mid-20’s to the “P&C Hand Forged Tool Co.”. Tools were marked with the familiar P&C enclosed in a hexagon, which may have began in 1926. The annual catalog had grown from approx 10 pages to 30. The product line included boxed tool sets and collections as opposed to the earlier individual tools. Slim rounded tools with distinctive lines continued to be proudly advertised with a composition of “chrome vanadium steel”. Chrome vanadium steel in general is composed of carbon, manganese, phosphorus, sulfur, silicon, chromium and vanadium. Chromium and vanadium add hardness and refinement to the steel’s grain. Chromium also helps resist corrosion and oxidation as well as improving elasticity. The trick of course, is in the percentages added and the purity of the chromium, vanadium and other ingredients. When making tools, the other “x factors” are the heat of the piece, the type of quench medium, the quenching duration, tempering, etc.. The chrome vanadium combination has been used extensively in Europe. John and Charlie undoubtedly learned techniques of working with this alloy in their fathers’ shops. Del Tin of Italy manufactures exquisite historical European swords using chromium and vanadium. Del Tin’s swords have been used in movies like Braveheart, The Three Musketeers, and Robin Hood: Prince of Thieves. 1929…1929 was marked by the titanic crash of the U.S. stock market known as Black Tuesday in late October. Black Tuesday ushered in an economic depression in the United States that extended for years, now known as the Great Depression. A brutal business environment ensued, balanced on the other side with the scarcity of good jobs for the working population. By all accounts, 1929 was the pivotal, even stormy year for P&C. Growth pains and company planning and development created a cascade of rapid change prior to Black Tuesday. The change began when a disagreement arose between Ned and John and Charlie. According to John Derville Jr., the dissent centered around two issues. First, a disagreement arose over Ned’s exclusive contract to sell P&C Tools. Secondly, Ned’s California contacts had resulted in the procurement of a large contract for P&C tools with a California aircraft manufacturer. John and Charlie disapproved of the contract because it would have resulted in abandoning their regular customers and re-tooling the P&C factory. The disagreement resolved with Ned selling E.A. Boyd Inc. to his friend John C. Derville for $4,000. Derville quickly renamed the business General Tool Co.. Under John Sr., John Jr. and his son Bill, General Tool Company grew and prospered from 1929 until 2009 when it was purchased from the Dervilles by Motion Industries. By 2007, General Tool Co. generated about 63 million in revenue and had expanded to four locations in Oregon, Washington, and Idaho. General Tool also owned a subsidiary named Industrial Tool and Supply located in Arizona. Bill Derville continued as president of General Tool after acquisition by Motion Industries, but has since retired. After the sale of E.A. Boyd Inc., Ned Boyd re-located to Emeryville, (suburb of Oakland) California and built his own tool manufacturing company. Before leaving Portland, he convinced two P&C employees to join him, Sherm Haskins and Pete Mortensen. Pete Mortensen may have returned to P&C Tools later. According to John Derville, Ned wanted a Swedish name for his company. Swedish immigrants were well respected in general and Swedish steel enjoyed a reputation of high quality. Based on those issues, Boyd adopted the Swedish sounding name “Thorsen Tools Inc.” for his new company. While Thorsen may have sounded Swedish, those of Scandinavian descent recognize that the “sen” suffix is indigenous of Norway or Denmark, not Sweden. A Swedish “son of Thor”, would have been spelled “Thorson”. By 1940, Thorsen Tools had dwindled to five employees, and was sold by Boyd. Thorsen was turned around by the new owners and enjoyed a success story similar to General Tool Company. Thorsen is still in existence at this date. On August 1, 1929 an article in the Milwaukie Review announced a new building being planned for construction at P&C. The article appears to have been the result of the Boyd departure and represents John and Charlie’s assurances to the local business and employee communities of P&C’s stability. In part the article stated, “Mr. Peterson states that there has been an attempt made to organize a company with a very similar name in Oakland Ca. and that there is connected with it ex-employees of the tool plant who, apparently have been trading upon the prestige and reputation of the P. & C. company. He states that steps are being taken to protect the Oregon company in a legal way.” Since these events were well under-way before the newspaper publishing date, it is reasonable to assume the fracturing of P&C’s operations and the departure of Boyd, Haskins and Mortenson must have occurred early in 1929. 1930…The chaos of 1929 might have claimed another P&C casualty. In late 1929, P&C Tools deeded Charlie’s Idaho farm back to him. In the 1930 Portland City Directory, Charlie is no longer listed as “v-pres P&C Hand Forged Tool Co.” as he had been in the 1929 Directory. Charlie was 58 years of age and probably tired. Charlie was a “maker” and a “fixer”. Did hiring and firing, engaging in business compromises, etc. wear on him to the point he wanted to return to the simplicity of “making” and “fixing”? At this point those questions are unknown, but Charlie made a quiet exit from P&C Tools. 1931…General Tools first catalog cover listed the company as the Northwest Distributors of P&C Tools with the following caption, “ASK FOR OUR ‘P. & C.’ TOOL CATALOGUE”. This does not appear to be the case for long. General Tool signed an exclusive distribution agreement with Thorsen for Oregon and Washington and Thorsen Tools were privately branded with the General Tool name. 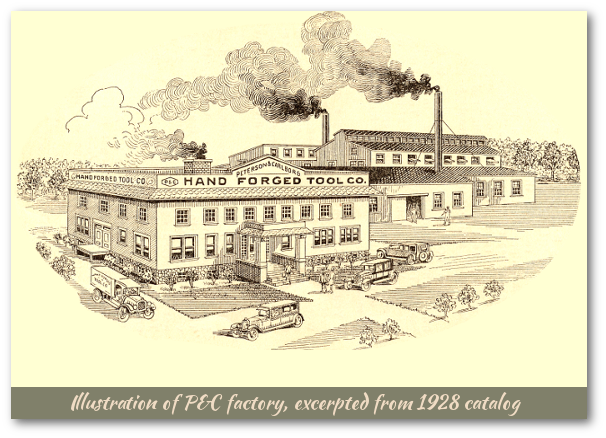 1935…The Ninth Circuit Court found in favor of P&C Tools in Eagle v. P. & C. Hand Forged Tool Co., 74 F.2d 918 (9th Cir. 1935). Samuel Eagle owned patent 1,380,643 (issued on June 7, 1921) on a flex head handle that was being manufactured by Plomb Tool Co.. Eagle felt that even though P&C’s flex handle was different, it was an infringement upon his patent. 1936…Woodbury and Company in their Tools & Supplies Catalogue C. listed fifteen pages of P&C Tools. The product line now includes tool chest sets, some with as many as 74 pieces. A new reversible ratchet with a “flexible head” is seen. 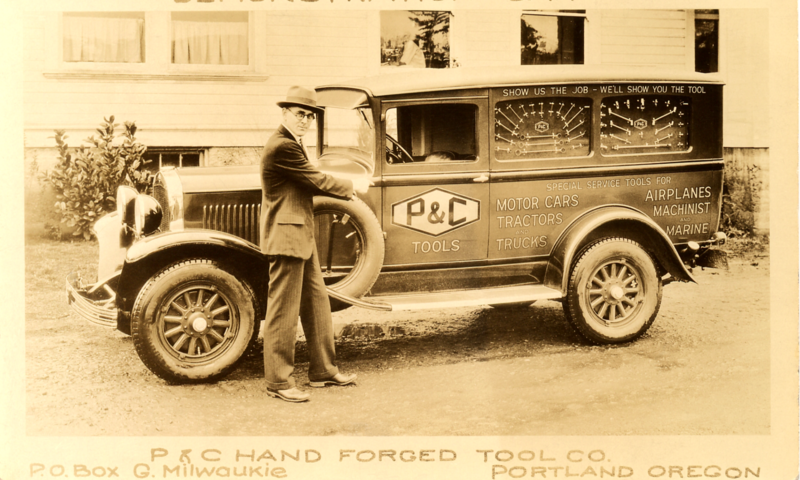 1941…John Peterson sells P&C Tools to Plomb Tool Company. 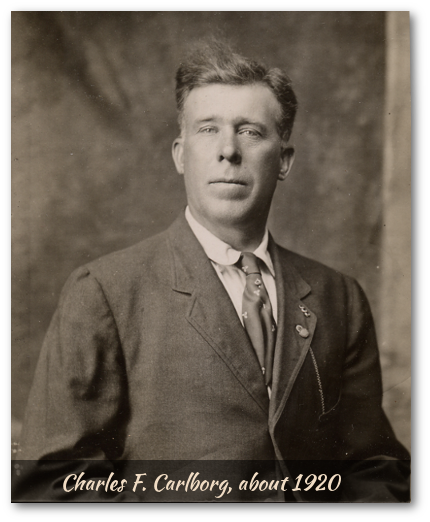 Plomb Tool Company had grown from blacksmith roots in a similar fashion as P&C and was obviously respected by John Peterson. John was 64 years of age.